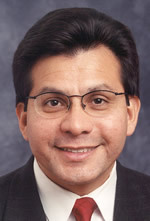 Alberto R. Gonzales (Al Gonzales), who served as White House Counsel to President George W. Bush, "whose tenure has been marred by controversy and accusations of perjury before Congress," announced on August 27, 2007 that his resignation was accepted the day before by President Bush. He departed from office September 17, 2007. Gonzales was nominated in November 2004 by Bush to succeed John Ashcroft as U.S. Attorney General. Michael Mukasey, nominated by Bush on September 17, 2007 and confirmed by the Senate on November 8, succeeded Gonzales as Attorney General. 1.2 Gonzales "lawyers up for investigations"
Gonzales "lawyers up for investigations"
"Former Attorney General Alberto Gonzales has hired a 'high-powered Washington criminal-defense lawyer' named George Terwilliger 'to represent him in inquires by Congress and the Justice Department.' Their 'top concern' is that DoJ Inspector General Glenn Fine may make 'a criminal referral to the Public Integrity Section of the Justice Department–or even seek the appointment of a special counsel to determine if Gonzales made false statements to Congress.'" "Investigators are look[ing] into allegations that Gonzales lied to lawmakers and illegally allowed politics to influence hiring and firing at the department." On August 28, 2007, Terwilliger's name was among those of the top five contenders to replace Gonzales as Attorney General. Terwilliger, a partner in the Washington, D.C. office of international law firm White & Case LLP, served as a deputy attorney general under President George H.W. Bush and led the team for the 2000 Florida recount for President George W. Bush. Was instrumental in "getting [then-Texas Governor] Bush excused from jury duty in 1996 - a move that allowed the governor to avoid having to disclose that he had been arrested for drunken driving in Maine in 1976," a fact kept secret until 2000. During 2007, in the face of multiple scandals including the Bush administration U.S. attorney firings controversy, Congressional support for Gonzales dwindled, leaving many members of Congress calling for his removal. ↑ Gonzales' resignation letter dated August 26, 2007, posted by TPMmuckraker, August 27, 2007. ↑ Pierre Thomas, et al., "Attorney General Gonzales Resigns," ABC News, August 27, 2007. ↑ "Gonzales Resigns," Think Progress, August 27, 2007. ↑ Jordan, Lara Jakes; (Associated Press) (September 15, 2007). "Attorney general bids farewell to Justice: Praises work of department", Boston Globe. Retrieved on 2007-09-19. ↑ Eggen, Dan; Elizabeth Williamson (September 19, 2007). "Democrats May Tie Confirmation to Gonzales Papers", Washington Post, pp. A10. Retrieved on 2007-09-19. ↑ Attorney General Michael B. Mukasey, United States Department of Justice, accessed March 2008. ↑ "Gonzales lawyers up for investigations," Think Progress, October 10, 2007. ↑ Lara Jakes Jordan, "Alberto Gonzales Hires Defense Attorney," Associated Press (WTOPNews.com), October 11, 2007. ↑ "5 Top Contenders for Attorney General," NewsMax, August 28, 2007. ↑ Klaus Marre, "Gonzales is out," The Hill, August 27, 2007. ↑ "Attorney General Gonzales resigns," CNN, August 27, 2007. This page was last edited on 1 August 2010, at 04:07.